Rio de Janeiro’s notorious shanty towns, known as favelas, are home to 11 million poor residents. Dating back to the 1970’s, these low income neighborhoods were formed when rural workers were shut out of the wealthier districts in the urban centers of Rio. Hampered with excessive violence, disease, and poor living conditions, favelas had become a symbol of poverty and blight in an otherwise pristine image of the southern hemisphere’s most visited city. Dutch artists Jeroen Koolhaas and Dre Urhahn made it their mission to began empowering the slums by integrating art into the residents lives. The result not only changed the scenery of the impoverished neighborhoods, but it also brought both the rich and the poor together to celebrate community and cooperation. 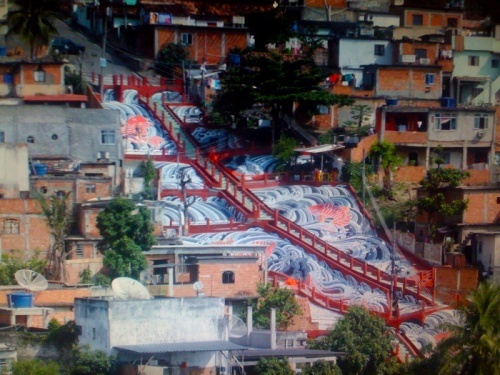 After filming a 2005 MTV documentary about Hip Hop in the favelas, Koolhaas and Urhahn, collectively known as Haas & Hahn, decided to help transform the appearance and confidence of favela residents by creating two inspiring murals with the help of local youth from the Ibiss Foundation’s Soldados Nunca Mais program. Eight months later Boy With Kite and Rio Cruzeiro was officially christened at a star-studded event that was attended by favela inhabitants, citizens of downtown Rio, and Brazilian celebrities like singer Fernanda Abreu. The success of their first project led Haas & Hahn to return to Brazil and create a work of art that would cover an entire hillside favela. 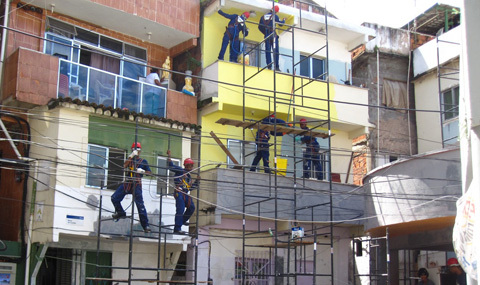 Praça Cantão, Communidade da Santa Marta once again incorporated help from residents of the community to paint their own houses. The local tenants were taught by TintasCoral on how to use different types of paint and vital safety measures to produce a vibrant color scheme that covered 34 houses and the surrounding streets. Besides gaining on-the-job experience, the community workers were also paid for their work. Haas & Han are currently working to raise enough money to continue expanding O Morro (The Hill) with the dream of painting the entire hillside. 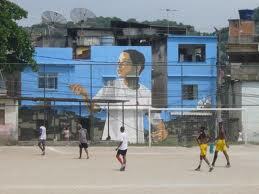 To donate funds to support future Favela Painting projects click it.